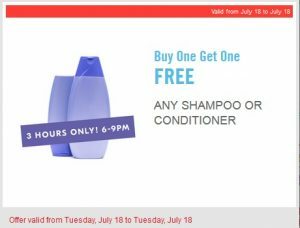 Check your Shoppers Drug Mart / Pharmaprix Optimum account for this one day only coupon. Buy One Get One FREE Shampoo or Conditioner. The offer does exclude salon and specialty hair care, so it will not apply to more premium priced products. This offer is only valid Tuesday, July 18th for only 3 hours – 6 – 9pm.